If you’re not following hair stylist Adir Abergel on Instagram, then do it now! 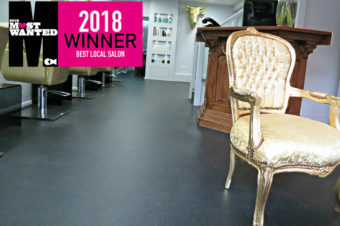 He tends to the tresses of some mega a-listers such as Bryce Dallas Howard (one of our fave red head girl crushes), Sandra Bullock, Anne Hathaway and Diane Kruger. Not only that but he loves blinging up hair, so much so he’s bringing out his own range of embellished hair accessories with hair accessory brand, Lelet NY. 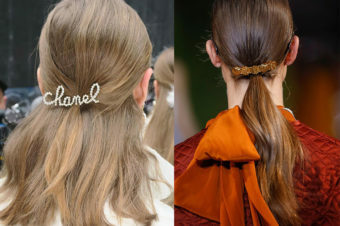 The collection includes metallic barrettes and metallic chains that you can work into plaits as seen here. We love. 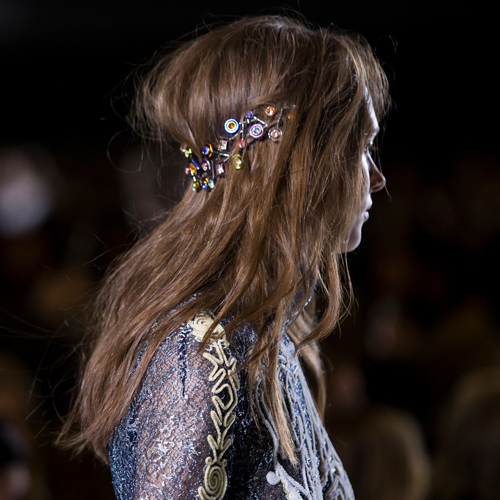 A little bit of sparkle makes your day all the more magical, so what better way to cheer yourself up than with a glittering hair accessory? At Peter Pilotto, Anthony Turner for L’Oréal Professionnel bent hair into loose waves and pinned it at the back with a broach which glittered under the catwalk lights. The look was inspired by Icelandic folk tales – beautiful and frosty, with a rugged feeling that keeps it feeling fresh, modern and unfussy. This look works well on day-old hair, as it shouldn’t look too polished – we love the matte finish and mussed up strands. Erdem is known for gorgeous floral gowns with a twist, and the hair, by Anthony Turner for Bumble and bumble, reflected this combination perfectly. 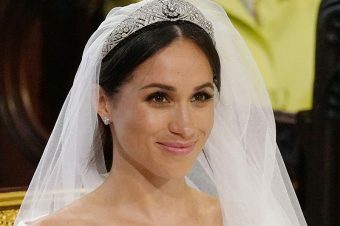 Hair was rolled into a low chignon and pinned at the nape of the neck, to create an elegant and classic hairstyle – before being slightly mussed up, with flyaways pulled out. 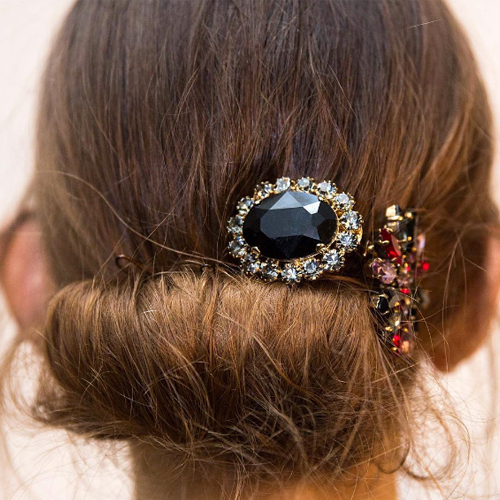 The finishing touches came in the form of two vintage style broaches, perfectly placed above the chignon. It’s the perfect combination of wow and understated – and so easy that anyone can pull it off. Super hairstylist Guido Palau pulled out all the stops for Redken at the Alexander McQueen show, to a create a look that was part classic updo, part rockstar and part vintage jewellery box. Sounds like it wouldn’t work, but it really does. Hair was pinned up, and an assortment of jewelled pins were added, and even a chain. 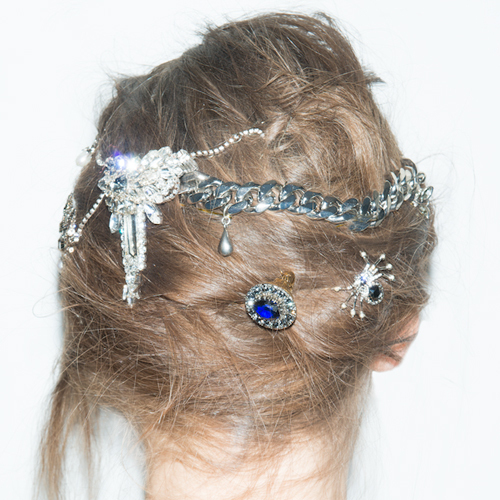 The secret to making these dazzling embellished hairstyles work? Make sure it has plenty of texture, allow it to move and never let it look too ‘done’.